Location: Céret, in the Pyrenees-Orientales departement of France (Languedoc-Roussillon Region). Notes: Château d'Aubiry is a new art style castle built in Céret (Pyrénées-Orientales) to the late nineteenth century.Industrial Pierre Bardou-Job who wanted to offer a castle in each of his three children, one of Ceret was for his son Justin. Commanded the Danish architect Viggo Dorph-Petersen, installed in the area, Castle Aubiry is built from 1893 to 1904. Pierre Bardou-Job will never see it since he died suddenly in 1892, just before the start of the construction. In all, the castle, chapel, greenhouse, the gardener's house, the terraces, the park and the entire frame located within the area of ​​the boundary wall (including the wall, its entrance gate the main avenue and the keeper's house) and the oratory Sainte-Marguerite, with the exception of buildings in the wine cellar; facades and roofs of the buildings of the winery and the corresponding housing and the influence of all the plots of the area concerned with the protection (ie. AH 12-14, 20-38, 40, 41, 43 to 46, 90 91, the main avenue being without a cadastral town road; AI 3) subject to registration as historical monuments by order of 19 January 2006. Château d'Aubiry, sur histoireduroussillon.free.fr. Consulté le 28 décembre 2011. 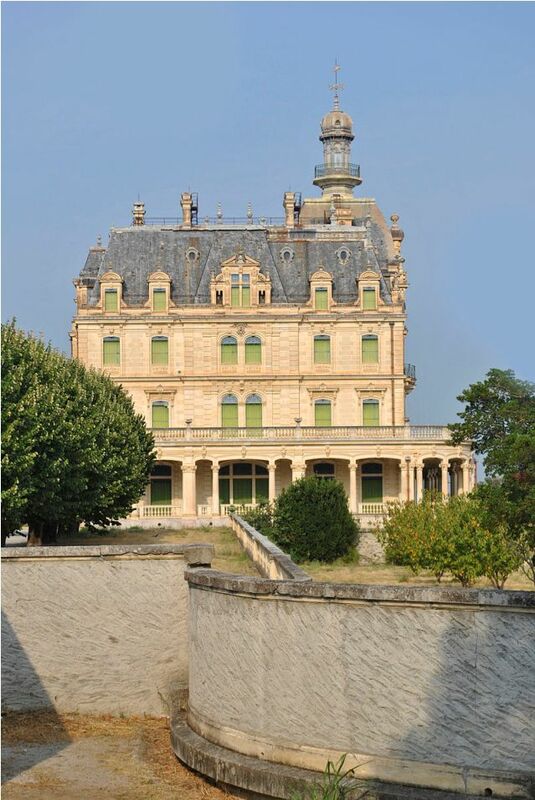 Château d'Aubiry, sur aphpo.fr. Consulté le 28 décembre 2011.